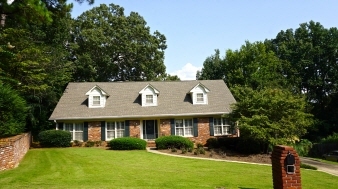 Lovely traditional home in Lake Oliver Estates of Green Island. Entrance opens to the formal living room, dining room, and library. Recently remodeled kitchen with new cabinets, appliances, and granite counters. Fireside family room leads to large deck. 4 spacious bedrooms with master and an additional bedroom on the main floor. Walk out to the terrace patio from the daylight basement with large playroom and 2nd laundry room. Double car garage. Conveniently located to shopping.